Our Gift for Gardeners' Soap Six Pack includes six soaps to clean and care for a Gardener's hands: Basil Lime, Cottage Rose, Cucumber, Lavender, Peppermint Lemongrass, and Tomato Vine. These Shea and Cocoa Butter Hand Repair Soaps for Gardeners will to help get those hands clean after being out in the Garden. We add stoneground cornmeal grits (the real thing, never instant, as any self-respecting Southerner knows, not even in a soap!) to our gardeners' soaps. The six bars included in our Gift for Gardeners Soap Six Pack are full size soap bars individually wrapped in colorful, coordinating paper cigar bands and corrugated cardboard and stacked inside a clear, cellophane bag, tied with matching color raffia. The gold product label also identifies the soaps inside the Six Pack. Olive, Coconut, Palm and Castor Oils, Sodium Hydroxide or Lye, Mountain Spring Water and/or Goat Milk, Shea and/or Cocoa Butter, ground botanicals, and scent by Natural Essential Oil or artificial fragrances. 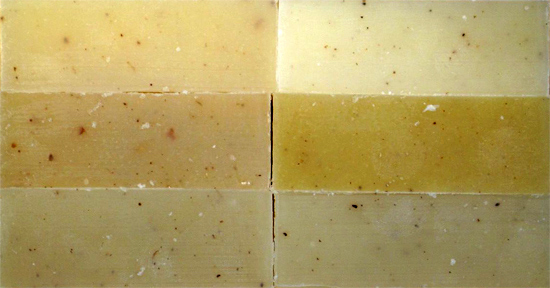 Specific ingredient information for each soap is included on each individual soap's paper cigar band.